Their feast days are July 11 and February 10. On the occasion of the dedication of the rebuilt monastery of Monte Cassino in 1964, Pope Paul VI proclaimed St. Benedict the principal, heavenly patron of the whole of Europe. The title piously exaggerates the place of Benedict but in many respects it is true. St. Benedict did not establish the monastery of Monte Cassino in order to preserve the learning of the ages, but in fact the monasteries that later followed his Rule were places where learning and manuscripts were preserved. For some six centuries or more the Christian culture of medieval Europe was nearly identical with the monastic centers of piety and learning. Saint Benedict was not the founder of Christian monasticism, since he lived two and a half to three centuries after its beginnings in Egypt, Palestine, and Asia Minor. He became a monk as a young man and thereafter learned the tradition by associating with monks and reading the monastic literature. He was caught up in the monastic movement but ended by channeling the stream into new and fruitful ways. This is evident in the Rule which he wrote for monasteries and which was and is still used in many monasteries and convents around the world. Tradition teaches that St. Benedict lived from 480 to 547, though we cannot be sure that these dates are historically accurate. His biographer, St. Gregory the Great, pope from 590 to 604, does not record the dates of his birth and death, though he refers to a Rule written by Benedict. Scholars debate the dating of the Rule though they seem to agree that it was written in the second third of the sixth century. Saint Gregory wrote about St. Benedict in his Second Book of Dialogues, but his account of the life and miracles of Benedict cannot be regarded as a biography in the modern sense of the term. Gregory's purpose in writing Benedict's life was to edify and to inspire, not to seek out the particulars of his daily life. Gregory sought to show that saints of God, particularly St. Benedict, were still operative in the Christian Church in spite of all the political and religious chaos present in the realm. At the same time it would be inaccurate to claim that Gregory presented no facts about Benedict's life and works. According to Gregory's Dialogues Benedict was born in Nursia, a village high in the mountains northeast of Rome. His parents sent him to Rome for classical studies but he found the life of the eternal city too degenerate for his tastes. Consequently he fled to a place southeast of Rome called Subiaco where he lived as a hermit for three years tended by the monk Romanus. The hermit, Benedict, was then discovered by a group of monks who prevailed upon him to become their spiritual leader. His regime soon became too much for the lukewarm monks so they plotted to poison him. Gregory recounts the tale of Benedict's rescue; when he blessed the pitcher of poisoned wine, it broke into many pieces. Thereafter he left the undisciplined monks. Benedict left the wayward monks and established twelve monasteries with twelve monks each in the area south of Rome. Later, perhaps in 529, he moved to Monte Cassino, about eighty miles southeast of Rome; there he destroyed the pagan temple dedicated to Apollo and built his premier monastery. It was there too that he wrote the Rule for the monastery of Monte Cassino though he envisioned that it could be used elsewhere. 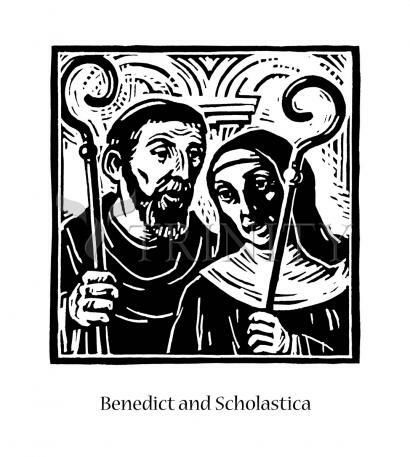 The thirty-eight short chapters of the Second Book of Dialogues contain accounts of Benedict's life and miracles. Some chapters recount his ability to read other persons' minds; other chapters tell of his miraculous works, e.g., making water flow from rocks, sending a disciple to walk on the water, making oil continue to flow from a flask. The miracle stories echo the events of certain prophets of Israel as well as happenings in the life of Jesus. The message is clear: Benedict's holiness mirrors the saints and prophets of old and God has not abandoned his people; he continues to bless them with holy persons. Benedict is viewed as a monastic leader, not a scholar. Still he probably read Latin rather well, an ability that gave him access to the works of Cassian and other monastic writings, both rules and sayings. The Rule is the sole known example of Benedict's writing, but it manifests his genius to crystallize the best of the monastic tradition and to pass it on to the European West. Gregory presents Benedict as the model of a saint who flees temptation to pursue a life of attention to God. Through a balanced pattern of living and praying Benedict reached the point where he glimpsed the glory of God. Gregory recounts a vision that Benedict received toward the end of his life: In the dead of night he suddenly beheld a flood of light shining down from above more brilliant than the sun, and with it every trace of darkness cleared away. According to his own description, the whole world was gathered up before his eyes "in what appeared to be a single ray of light." St. Benedict, the monk par excellence, led a monastic life that reached the vision of God. Died: March 21, 547 of a fever while in prayer at Monte Cassino, Italy; buried beneath the high altar there in the same tomb as Saint Scholastica. —Excerpts from The Modern Catholic Encyclopedia (A Michael Glazier Book), Liturgical Press (1995) 78-79. Is it not a thing to be marveled at, that a woman, who for a long time had not seen her brother, might do more in that instance than he could? She realized, according to the saying of St. John, "God is charity." Therefore, as is right, she who loved more, did more.